The FX Industry will host many expos, trade fairs, trade shows and conferences in 2019 that you should not miss as an Industry Professional. Whether you want to attend the events as a participant or even as an exhibitor, you need an overview of upcoming events to find out which ones you want to attend. That is a lot of work, right!? 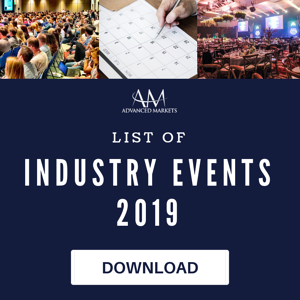 To save your valuable time, Advanced Markets prepared you a FREE list of FX Industry Events 2019 - with 65+ Expos, Trade Shows and Conferences from the Forex, Crypto and FinTech Industry. Just fill out the form and you will receive the events list immediately! In order to help you make this events planning process simpler and less burdensome for you, we would like to recommend our ROI Estimator to you. The estimator supports you to determine if an event yields enough new business to justify the cost of participation. You can download the spreadsheet to get a rough estimate for free - Just submit the form!